A superlatively good duck terrine seasoned with green peppercorn and a touch of Armagnac. The flavour of green peppercorn shines through and the texture and appearance of the pate are perfect. Pork meat and fat, duck meat 22%, poultry livers, eggs, white wine (sulfites), starch, gelatine, green pepper 1.5%, salt, spices, dextrose, sugar, aromatic plants. 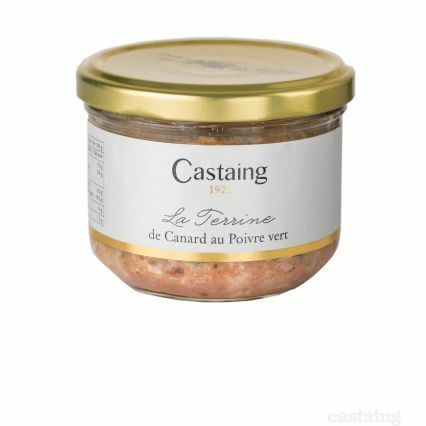 Makes a delicious French starter served cool on some lightly toasted bread, with some cornichons and a glass of red wine.